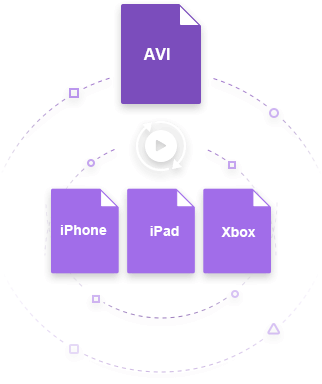 Convert AVI to iPhone, iPad, Xbox, and more formats. Convert DVD to AVI, MP3, MP4, MOV, MP3 and other 1000 formats. In order to make your slideshows more presentable, interesting and persuasive, convert PPT to a popular video format like AVI. Moreover, the PPT files might not be compatible with a number of players and devices. To make your slideshows accessible to all, you can convert PPT to AVI or PPTX to AVI for better compatibility. Once converted, you can even transfer the content of your PPT slideshow to your USB drive, share it online or with your colleagues. Using a good professional tool, customizing your PPT is also possible with features like adding background music, slide transition, and others. To make your PPT to AVI conversion possible, discussed below are the best solutions. If you want your PPT files to be converted to high-quality AVI and other video formats, Wondershare PPT2Video Pro is excellent software. This PPTX to AVI converter is compatible with Windows PC and allows retaining all the features of your original file. In addition to AVI, you can convert your presentations to other file formats like MP4, MOV, MPEG-1, MPEG-2, and others. 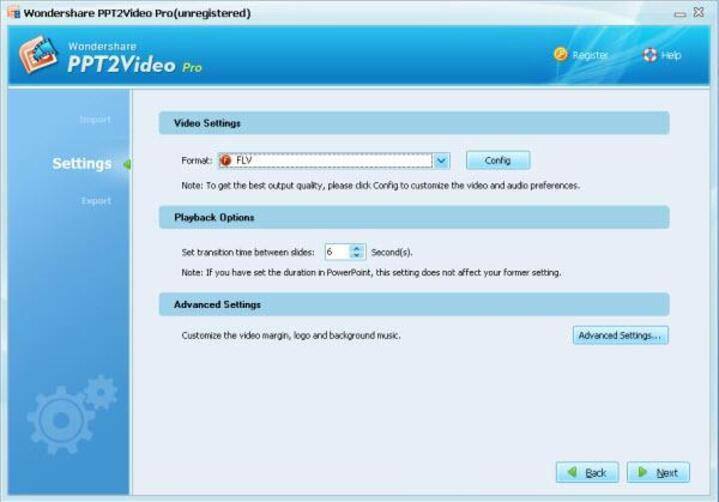 Convert PowerPoint to AVI, MOV, HD, and other video formats. Allows converting 12 PPT files at a time with its batch processing facility. Retains all the transitions, animation, effects and narration of the PPT file. Facilitates converting PPT to over 130 preset output profiles in just a click. Converted PPT files can be uploaded to YouTube, Facebook, and other sites. Allows customizing the video settings. Step 1 Launch Wondershare PowerPoint AVI tool and add PPT files. 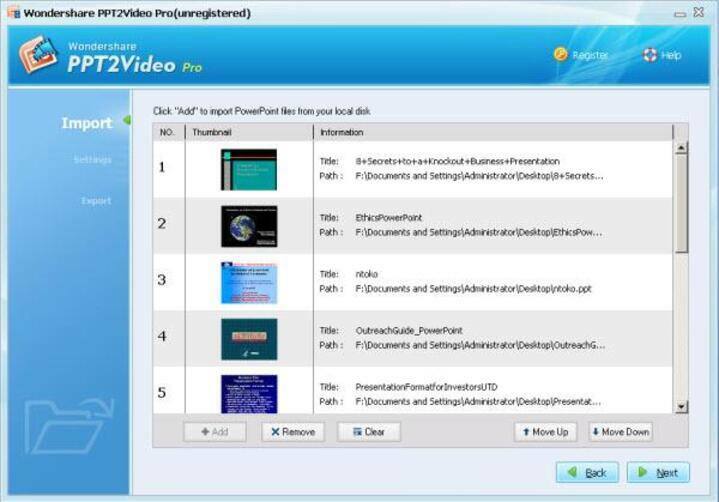 Once PPT2Video Pro is downloaded and installed, open the program on your computer. From the welcome window, choose Create Video Files from the PowerPoint option. In the Import panel, hit the Add button to load PPT files from your system. Multiple files can be added here. To continue, click Next. Step 2 Choose output settings. Move to the Settings tab from the left side of the window. Under the Format drop-down menu, select AVI as the desired target format. Here you can choose the playback options and also the advanced settings for the video. Click on Next to continue with the process. Step 3 Convert PowerPoint to AVI. Choose the output folder on PC where you want to save the converted file. Click on Start to kick off the conversion process. The PowerPoint to AVI converter online for converting your PPT presentations to AVI and other formats are available as well. One such decent program is Online Convert. This free tool can be used from the browser window of your computer and need no download or installation. Using the PPT to AV converter online, you can convert your PPT files to AVI format in good quality in a few simple steps. The program also allows customizing the file parameters with respect to resolution, bit rate, frame rate, and others. PPT files can be added from your system, URL or cloud storage. Conversion file can be directly downloaded from Online Convert interface. 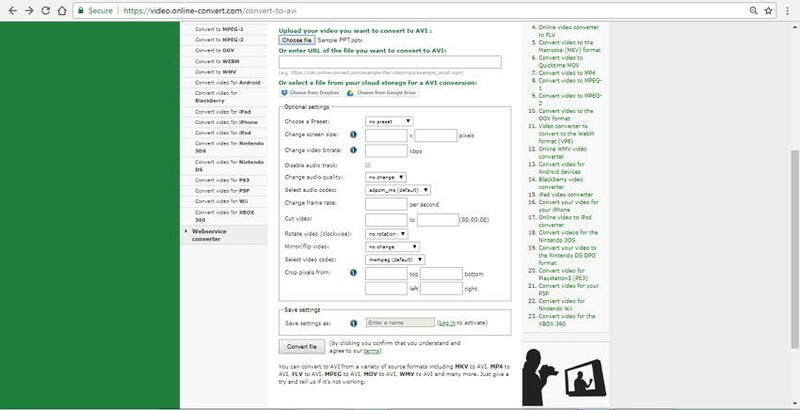 Step 1: Open https://video.online-convert.com/convert-to-AVIto enter the PPT to AVI converter online tool on your PC browser. Click on Choose file to add PPT file from your PC, cloud storage or using a URL. Step 2: Under the Optional Settings, select file parameters as needed. You can also save the conversion settings for the future files. Step 3: Click on the Convert file button to start the conversion process. 1. Can We Convert PPT to AVI with Microsoft PowerPoint 2010? Microsoft PowerPoint 2010 has a feature which allows you to save your created presentation into a video format, but the supported formats include MPEG-4 and WMV. So you can create your presentations into MP4 of WMV, and then convert it to the needed AVI format using a converter program like Wondershare UniConverter (originally Wondershare Video Converter Ultimate). 2. How to Add AVI to PowerPoint? The PowerPoint program allows adding AVI files to your existing presentation if needed. 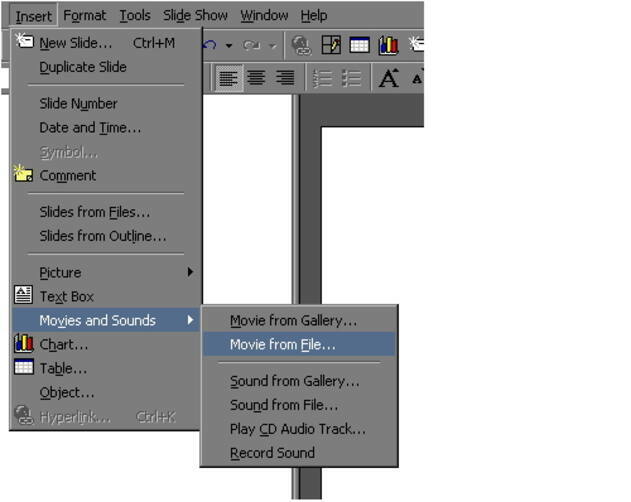 To insert AVI into PowerPoint, open the app of PowerPoint on your PC, click the Insert button and choose the option of “Movies and Sounds”. Next, click on “Movie from file” option to browse and add AVI file from your PC. A window will open to ask you to confirm whether you wish to play the file Automatically or when Clicked. Choose the desired option and your AVI file will be added to the presentation. Here it needs to be noted that added file will play within the presentation only on the system on which it is created. To watch the video in PPT file on other computers, use the Pack and Go feature of the application. 3. How to add YouTube video to PowerPoint? The PowerPoint application allows adding the YouTube videos to your presentation. In fact, YouTube is the only supported streaming site by PowerPoint for adding videos. To add the video, open the YouTube video on your browser and hit the Share button on the YouTube page. Next, click on the Embed tab and copy the embed code. Next, open PPT slide on the app to which you wish to add the video. Click the Insert tab and select the online Video/ Video from Web Site option. Paste the copied embed code and select from option to play video Automatically or When Clicked. Note: The added video will play only when you are connected to the internet. There is no option to play it offline.